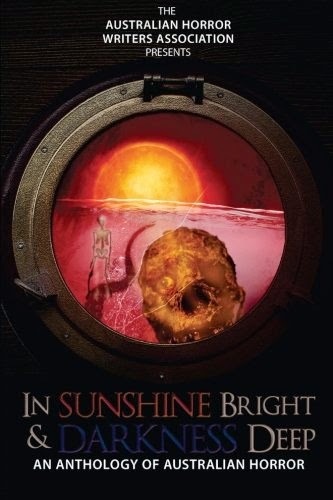 Steve Cameron: Science Fiction & Fantasy Author: In Sunshine Bright And Darkness Deep. In Sunshine Bright And Darkness Deep. And so I can announce my story, Bloodlust, has been selected for inclusion in the inaugural Australian Horror Writers Association showcase, In Sunshine Bright and Darkness Deep. Slated for publication at Halloween, the TOC and cover were published online last week. I'm pleased to be included alongside name writers like Marty Young, Cameron Trost, Jason Nahrung, Joanne Anderton and Dan Rabarts. I love the cover artwork by Greg Chapman. And the blurb? Those South-East Asian vampiric gangsters would be mine. I first encountered them when I was walking through the KLCC underground passages in Kuala Lumpur. They didn't want to stay there, hidden away. "In Sunshine Bright and Darkness Deep is an anthology like no other. The tales herein will take you on a weird and terrifying journey. You will set out on a road trip and find yourself trapped in the arid Australian outback where a little girl and her grandfather struggle to survive. There are isolated farmhouses threatened by bushfires and bullets, and rainforests teeming with bloodthirsty bugs. The cities are full of trouble too. The murky waters of the Brisbane River hide spiteful spirits and the suburbs are infested with insane inhabitants masquerading as ordinary human beings. Then, you will leave Australia, departing from Melbourne, to hunt down vampiric gangsters in Southeast Asia, before sailing future seas and visiting realms beyond this world altogether. This inaugural showcase anthology features the work of just a handful of the many talented and darkly imaginative authors who make up the Australian Horror Writers’ Association. If you are unfamiliar with Australian horror, let this book be just the first step on a long voyage of discovery." This anthology is going to be part of Australian horror history. I should have the proof copy any day now. Looking forward to seeing it in the flesh! I Love A Good Review.